Queensland Whistling Tarantula Phlogius (Selenocosmia) crassipes is native to the east coast of Queensland, Australia. Its common name comes from its ability to produce a hissing noise when provoked, a trait it shares with some other Australian theraphosids. This hissing is produced by the spider stridulating a patch of setae associated with its chelicerae. The species name crassipes is Latin for "fat leg" referring to the relatively fat front legs. This spider can attain legspans of up to 22 cm, normally a big adult is about 16cm. 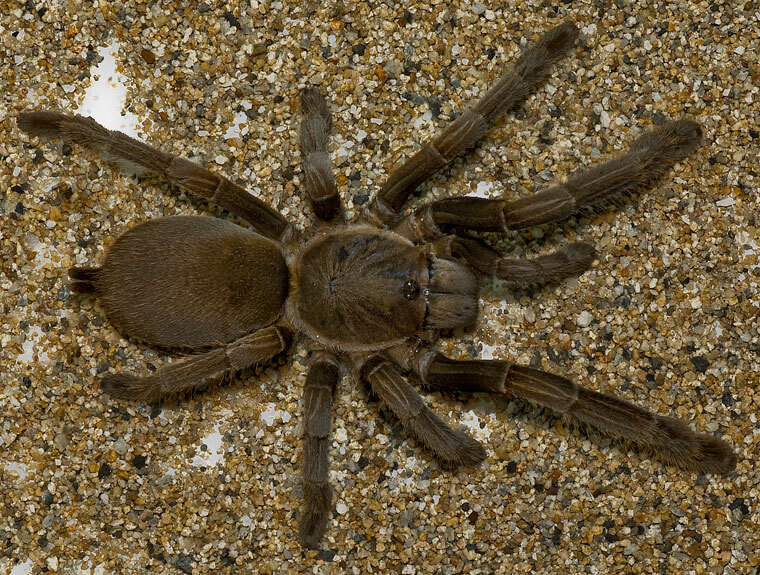 Its body length, from eyes to the rear of its abdomen, measures between 6 and 9 cm, making it the largest Australian tarantula. This species is quite shy and normally does not wander far from its burrow. Young spiders find natural burrows under rocks or roots, occupying and widening natural spaces. Adults expand and extend burrows of up to 2 metres long lined with silk with a tunnel off the main tunnel going upwards to a chamber with an air pocket sufficient to last a few days. The name Barking Spider is inappropriate as this spider does not bark. Another common name "bird eating spider" is also false as this spider does not normally eat birds. Identification is realtively simple as this very large spider has thicker front legs than back legs. Females live up to thirty years, males up to eight years. The bite is not fatal to a human, but can cause up to six hours of vomiting. The venom can cause death to a dog or cat within thirty minutes. Widely sought after as a pet, it is harvested from the wild, often illegally, a threat to its natural population. The current generic name Selenocosmia has been wrongly applied to the Australian species and will be revised, the generic name Phlogius being reinstated (Raven pers. comm. ).